Motorcycle helmet visors as accessories to make your motorcyclist look even more unique. Order the visors while choosing your helmet! In our shop it's all about the uniqueness and the desire to help the customer create the original, classic look. This also applies to the sun visor for the helmet, which is often nowhere else available in Europe. We have selected these accessories based on quality and unique appearance. The colors that are available for the visors can be perfectly combined with our jet helmets and some of our . The helmet visors and / or flaps can be selected during the ordering process so that you can order the matching accessory with the helmet! Do you already have a nice helmet at home and you only want to order a helmet visor with push buttons, that is also possible. You can also order a loose visor or a separate valve from us. The majority of our visors and valves have universal push buttons that you can attach to any helmet that also has this possibility. There are also a number of visors with an elastic band that you can wear with every helmet. We offer great diversity of styles and colors. Want a vintage retro visor or a modern bubble visor with an orange or yellow color, all shapes and sizes are available! Especially the color of the visor can be a decisive factor in the choice you make. It may be important that it matches the color of your helmet or motorcycle. But you may also find it important that you, by choosing a yellow or orange visor for example, have a better view when it is dark. 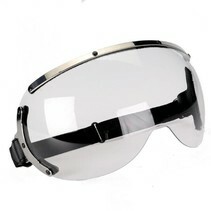 The bubble visors have an official quality mark and protect against flying stones and insects and, unlike the motorcycle goggles, cover the entire face. Take a quick look at our visor category.